Throughout history, the greatest leaders have also been motivators, able to encourage others to work toward a common goal. This ability to motivate has largely been a result of solid communication skills. Abraham Lincoln and Winston Churchill, two of the most effective leaders in history, approached challenges in different ways, but both excelled at communication. Following the examples of these great leaders, it is critical that managers prioritize and hone their communication skills to successfully guide their teams and drive overall productivity. Research indicates a strong link between communication and effective leadership. A study conducted by Weisman Success Resources found that 44 percent of responding business leaders reported they were unhappy with their employees’ work. Of that group, 70 percent said they felt they needed to improve how they communicated with their employees in order to resolve the performance issues and improve motivation. 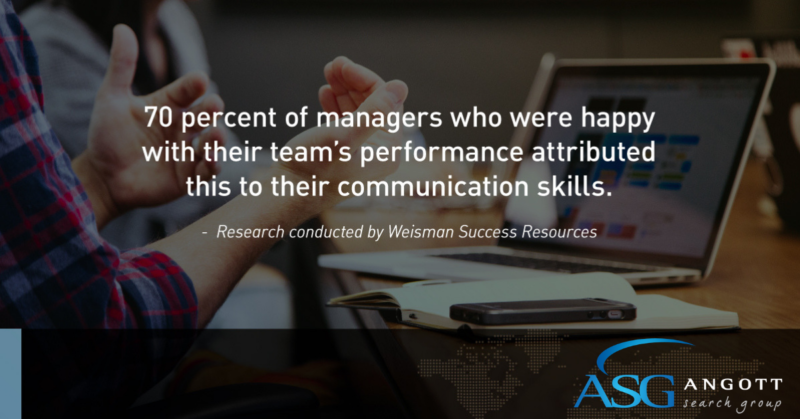 Of the group that was happy with their team’s performance, 70 percent of the managers attributed this to their communication skills. Effective leadership communication is clear and simple. Don’t be vague when discussing what you want from your team. Communicate clearly the goal of the task, how long you expect it to take, any resources they’ll need, and relevant information that might help streamline the process. You lose productivity when staff have to circle back around to you for clarification on important information. Leaders rarely have the luxury of speaking to one person at a time so the good ones learn how to make every single person feel as if he or she is being spoken to directly. They make everyone in a room feel important. Getting to know your employees on a more personal level and making it a point to acknowledge them can also go a long way in getting your team behind your vision. Strong leaders are transparent in their communications. They want their team to trust not only what they say, but what they mean. There shouldn’t be any hidden agendas or reading between the lines. When leaders can’t share certain information, they need to come right out and say it, because half-truth answers breed distrust and anxiety. In good times and bad, honesty builds trust. Communication is a two-way street. Listen to the interests of your team and get a feel for their perspective on how to achieve goals. Effective listening helps you build relationships, solve problems, ensure understanding, and improve accuracy. Taking a moment to listen takes less time in the long run, making you more productive. The best communicators never assume that the message people heard is the exact one they intended to deliver. They check in to verify that their message was understood correctly, and, if it was not, they don’t blame the audience. Instead, they change things up and try again. When good leaders make a mistake, they admit it right away. They are accountable for their words and actions, and they do it without drama or false humility. Perhaps the most important principle of effective leadership communication is the ability to inspire those around you. As a leader, you have a vision of success that you want to achieve with the help of your team. It’s up to you to rally your team around that goal and help them embrace the vision and to work hard toward the goals of your organization.